How do we build the amount of Google searches we get? Is there a correlation between a businesses Google searches and their stock price? Businesses can adopt a solid marketing and branding strategy that allows their Google search volume to increase. Strong branding usually shows there is a good impression of the company among users and consumers. The most important reason branding is essential to a business is because it is how a company gets recognition from consumers, which also allows for increased in Google searches and best of all a page 1 Google ranking. Branding is vital when trying to boost future business, and an established brand can increase a business’ value by giving the company more leverage in the industry. This makes it a more appealing investment opportunity because of the business’ established place in the market. Therefore, we see a growth in stock price. Why is this relevant? You want your brand to be talked about, to be seen, but not if it is linked to your brand. Your brand may suffer and consumers may recognise it for related negative press. Businesses of course suffer from bad press for a variety of reasons and Google does not discriminate. Websites that have Google ranking them on the first page of its search results for any given search are the ones to be considered most relevant or useful. Rankings are rankings and can still increase whether the information on page one is positive or negative. If a company is growing successfully, they may have a high ranking but what if there has been a scandal within a company? Their stock growth may drop, but there google search might increase due to consumer curiosity or concern! 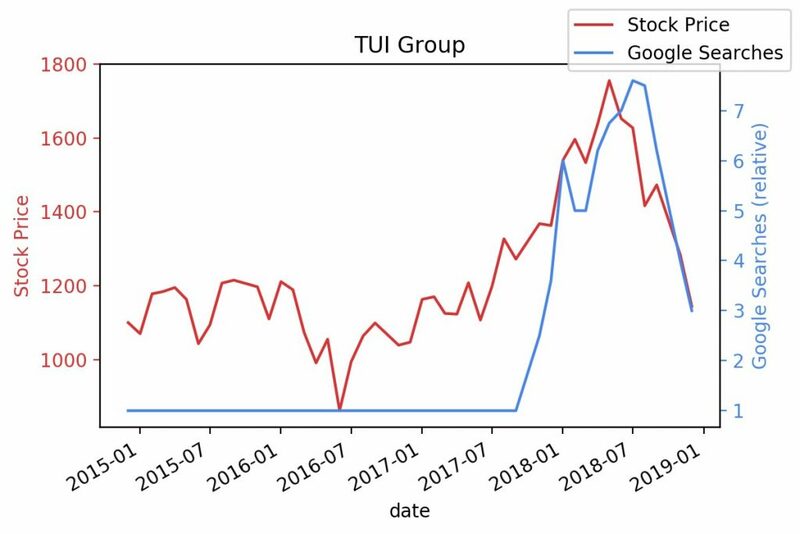 We have pulled data from FTSE 100 companies to see how their Google rankings correlate to stock growth. Associated British Food is a British multinational food processing and retailing company. Known to be hovering over their debts but stable, their Google search results and stock price is almost perfectly contrasting. With a large-cap stock it is considered by a lot of investors as a safe investment bet. But research has shown that if a word such as “debt” increases in search frequency or decreases in search frequency from one week to the next, the Google ranking is obviously affected. With higher debt levels, stock price falls and Google ranking rises. Oil and gas stocks represent an essential portion of the energy sector. In fact, they are often considered to be apart from other types of energy companies and this is because oil exploration, production and distribution companies foresee any fortunes to be very much linked to the price of crude oil, and it makes a lot more sense to consider these companies as their own entity. They are a huge global market holding large amount of asset. 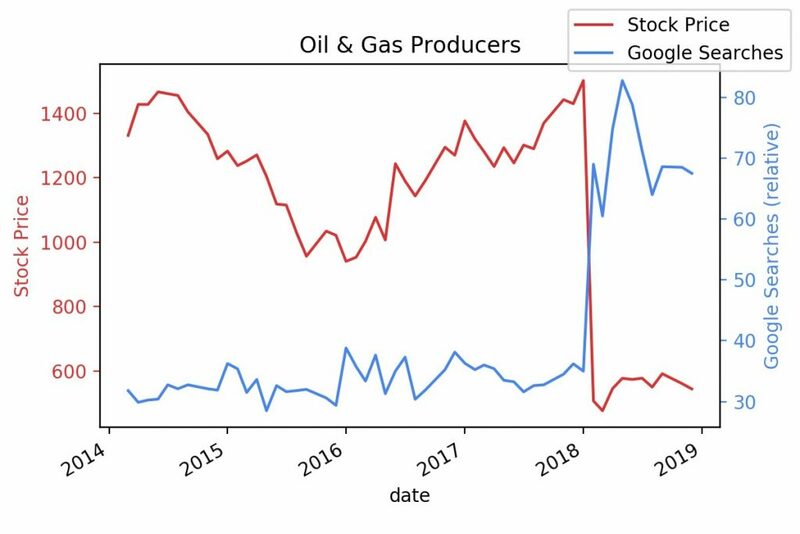 If there has been a crash within the oil stock price, Google search will inevitably rise as people demand further data and information. There is a clear relationship within oil and gas companies. A high level stock price means a lower Google search. Can we bring short-term sales goals and long term value together through brand-building and marketing? Originally known as Thomson Holidays, the holiday company decided to undertake a total rebrand, becoming TUI, in 2017. The path from Thomson’s transition to what it is known as today, Tui, was very long. A large ad campaign launched on the October 18th 2017 to reinforce the rebrand with one last big push. So how did this affect the company? In 2017 (see graph below) amidst all the change, the company shot up in terms of stock prices and Google searches - a clear growth that can be put down to the massive rebrand that they worked so hard for. It paid off. Tui had never done so well as a company before. The CMO of TUI, Kate McAlister, explained that upon rebranding, they were able to see that brand awareness had increased by 36% in one year, not to mention the growth of sales predicted to go up too. Branding is a consistent combination of several factors that come together to create a company’s image. Strong brands performed 20% better than weaker brands, looking overall. So how does branding impact stock price? Companies that have greater brand values experience significant positive returns. On average brand power accounts for 5% of a company’s stock price. Branding is also important when trying to cultivate more business. A strongly established brand can grow a business’ value by giving the company more leverage in the industry. This allows it to be an appealing investing opportunity as it is a firmly established place within the marketplace. Lastly, it generates new customers add clients. 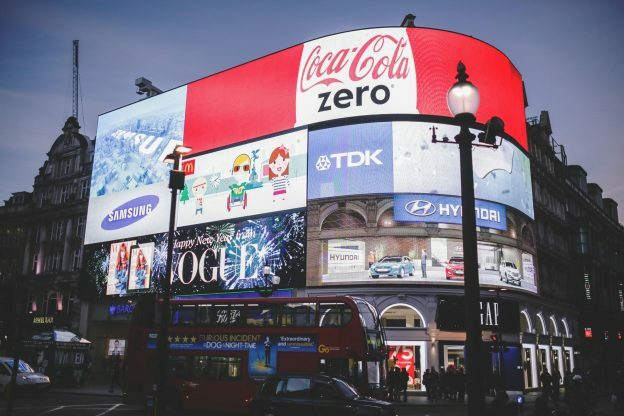 Once a brand has been well-established, not only will its Google ranking rise but also word of mouth will be one of the company’s most effective advertising technique. Brands with coherent strategies will help build the company’s consumer-trust, as well as potential clients and customers.